Whey…it’s the partner to curds, as many of us learned early on from the Little Miss Muffet nursery rhyme. Whey…it was not that long ago that cheesemakers cringed when they heard this four-letter word, as it was considered a worthless byproduct, one that required extra effort to ensure proper disposal. Whey…today it is one of the most in-demand ingredients in the food and beverage formulating world. Here’s why. Cows milk contains two types of proteins: casein and whey. Casein remains in the curd during cheesemaking while whey is washed away in the liquid stream after curd draining. Interestingly, the tables have turned for cheesemakers, with many producers referring to their business as whey making, as they consider cheese to be the byproduct these days. This is because whey proteins are recognized as powerhouse proteins. They are complete proteins, as they contain all of the essential amino acids the human body needs. They are also easy to digest. But most important, whey proteins are one of the best sources of branched-chain amino acids, in particular leucine, which has been shown to stimulate muscle synthesis. Whey proteins are also on trend with many of today’s health and wellness regimes. For those trying to lose or maintain weight, calorie for calorie, research shows that whey proteins can help people feel fuller longer than carbohydrates or fats. Further, reduced-calorie, higher-protein diets may improve the quality of weight loss by helping one lose more fat and maintain more lean muscle. When exercise is part of the equation, there’s more lean muscle development. And after exercise, whey proteins help build and repair muscle. To read more about the benefits of leucine, click HERE. According to research from Mintel, introductions of foods and drinks making a high protein claim are almost three times higher in the U.S., but other countries are catching up, and quickly. “Americans are looking for protein to aid in satiety, weight management and to boost muscle recovery and build muscle after a workout, making protein appeal to a broad audience in a great number of usage occasions,” said Nirvana Chapman, global food science trend analyst at Mintel. To read about Innovative Ways to Formulate with Whey, an article I wrote for Food Business News, click HERE. Now, check out these recent innovations made with whey proteins. Being an iced tea aficionado, I find this afternoon refreshment very attractive. I discovered it while attending Anuga this past October. 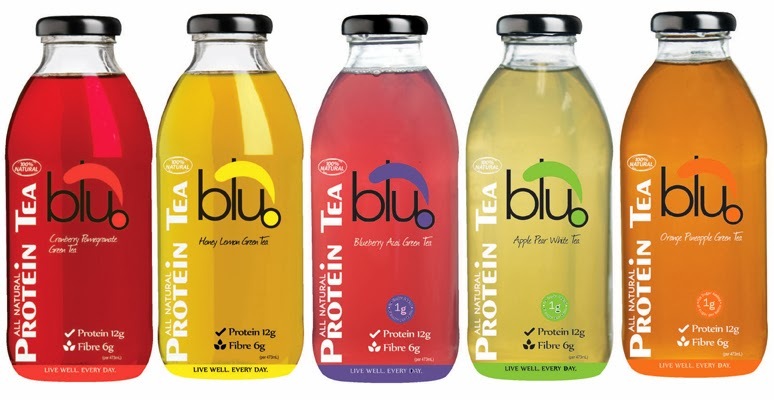 Produced by Blu-Dot Beverage Co., in Ontario,, Canada, Blu-Dot Protein Teas come in five flavors and two different sweetener types. There are two versions—Cranberry Pomegranate Green Tea and Honey Lemon Green Tea--mildly sweetened with organic cane juice. The calorie-reduced Protein Teas are naturally sweetened with stevia. These three varieties—Apple Pear White Tea, Blueberry Acai Green Tea and Orange Pineapple Green Tea--contain only 1 gram of sugar and 60 calories per bottle. But most importantly, each 16-oz. bottle deliver 12 grams of whey proteins (from whey protein isolate) and 6 grams of fiber in the form of inulin. For more information on this product, visit HERE. Another very exciting concept also has its origins in Canada. Identifying a need within the protein beverage category for a product that combines the benefits of fresh milk with a healthy dose of protein, Saputo, Canada’s largest dairy processor, offers Milk2Go Sport. 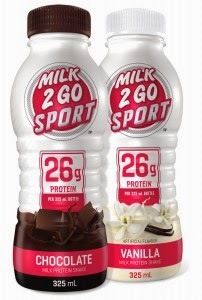 With 26 grams of protein per 325-milliliter bottle, new Milk2Go Sport is a ready-to-drink, milk-based protein shake that not only helps stimulate muscle repair after workouts, but also dulls hunger, which can further assist people who are trying to lose weight. 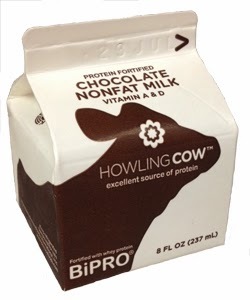 The protein comes from milk’s inherent 1 gram of protein per 1-ounce of fluid milk, along with the addition of whey protein concentrate and milk protein isolate. For more information, visit HERE. Also, check out this awesome Milk2Go Sport commercial by clicking HERE. The first Greek-style cottage cheese, and I believe the only one to date, rolled out this summer. It’s super yummy and super good for you. Kemps Greek Cottage Cheese comes in single-serve 5.7-ounce cups for on-the-go dining. Based on cultured skim milk, each single-serving contains an impressive 19 to 21 grams of protein thanks to the addition of whey protein concentrate and milk protein concentrate. There are four varieties: Cucumber Dill, Peach, Pineapple and Plain. For more information, visit HERE. 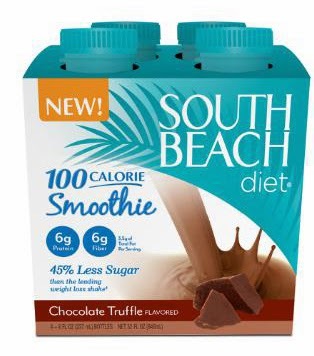 Most recently, South Beach Diet Corp., introduced South Beach Diet 100 Calorie Smoothie in a taste-tempting Chocolate Truffle flavor. Packed with 6 grams of both protein (from the addition of whey protein concentrate and milk protein isolate) and fiber (from the addition of soluble corn fiber), these snack-sized drinks are designed to satisfy all the way to the next meal. For more information, visit HERE. Tea, milk, cottage cheese and drinkable snack…dairy proteins have a home everywhere. Here’s some hot-off-the-press news on whey protein shelf life. In a study spanning more than three years, Davisco detected no significant change in flavor, aroma, color or nutritional composition in sweet dairy whey and deproteinized whey. The study was conducted in the Davisco warehouse, matching the real-world conditions products would face prior to shipping to customers. By tracking changes in composition, color, flavor, aroma and solubility, they demonstrated only minimal changes over a three-year shelf life. Davisco’s heat-sealed 4-milliliter-thick polyethylene liner is an excellent moisture barrier, and after three years, the moisture will only rise 0.1% to 0.3% within sealed bags. Because the moisture ranges in Davisco’s specifications lies within the zone of maximum stability for whey powders as defined by the theoretical moisture monolayer value, no significant changes in these measures occurred. If it were not for the declared shelf life printed on the product, it would be almost impossible for an analytical chemist to tell the difference between a three-year old Davisco product and a one-month old product through random sampling of lots within the company’s specification range, using these measures. A longer shelf life with Davisco whey powders will benefit warehousing, logistics, supply chain and manufacturers all the way to retail and consumer products. Customers of Davisco’s whey powders can expect excellent quality for the full three-year shelf life. That is the quality assurance that Davisco promises and delivers. For details on the storage conditions, methods used and analytical results, email you request HERE.